I introduced the brief and concept for my Deluxe Flux project over the semester in this post. Here is some more of the work I’ve done. We had 77sqm internal, and 11sqm balcony to work with. There were obviously some restrictions with positioning of services, block work, and windows. My main goal was to try and create as much storage and function as possible, and I feel good about what I’ve achieved in that regard. I don’t think I’m 100% satisfied, but you know, it’s my first go at designing an apartment, and I did end up with a Distinction for the subject, so it can’t be too bad! It got to a point where I had to just had to stop rearranging and tweaking, and be content with what I’d done. Not having real people to deal with, or budget constraints made it too easy to just keep working on it. I loved this space planning and design. I was so meticulous about measuring everything, and checking it against anthropometric data and ergonomics. I really wanted to make sure I’d thought through as much as possible, from a construction and building point of view, and also standing in the shoes of my client. Having a new baby, they will have a lot of new things that they need to keep somewhere, hence storage, and they will spend a lot of time in the kitchen, so it needs to be well integrated with living and play space. There are some details that aren’t specifically mentioned on this plan, like the custom seating in the kitchen nook features storage compartments, and some of the custom cabinetry like the shelving in the living room and bathroom. The nursery would also feature frosted glass louvre at the top of the walls to meet Building Code for ventilation and light. But to be honest I didn’t fully resolve this, because I’ve got cupboard space there. I have considered the construction implications of the position of the laundry, and have made a deliberate decision not to include an ensuite. The configuration of the toilet and bathroom next to the master bedroom was the next best thing, and created more space for a study nook and storage. I made decisions based on my original concept, and goals. But I do realise after the process, that sometimes you just end up in a certain place because you went to another place first. And it might not have ended up the best solution. It’s a complex process. Please find here the original shell of the floor plan, and just one drawing from my folio of drawings. My DELUXE FLUX APARTMENT DESIGN drawn in AutoCAD. 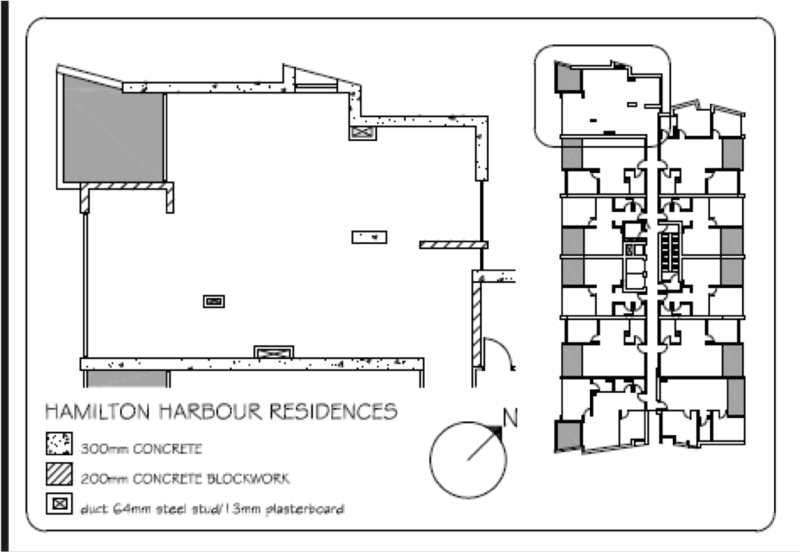 If you are interested in what Hamilton Harbour really did with the space, you can find the floor plan for this particular unit here. I can honestly say that I did not lay eyes on this floor plan until this very moment that I write this post.